You may have heard that Hotel Hana Maui, Maui’s most isolated resort on the east coast of Maui, has transformed itself and is now called Travaasa Hana. This 70 room resort is under new ownership and management and has upgraded its guest rooms. I would choose to stay in a Sea Ranch Cottage with sweeping views of the Pacific, but you might prefer one of the bungalow-style Garden Suites. The restaurant menu focuses on local organic cuisine, with traditional Hawaiian dishes as well as elements of Asian and Old World European Cuisine. Some of the signature dishes are Pohole Fern Shoot Salad, a native Hawaiian favorite; fish wrapped in Ti Leaves; fish smoked with guava and mango wood; Lilikoi Mahi with Hawaiian sweet potato and ginger lime coconut sauce; and an Open-faced Smoked Chicken Salad Sandwich on house-made bread with a locally grown sprout salad. Darn, now I’m hungry. The Spa also uses local plants in their treatments. There are many activity programs that are included in your room rate such as cooking classes and yoga on the beach. You can also choose a plan that includes meals and even a spa treatment. If you’re looking for a truly relaxing and authentic Hawaii vacation away from it all, this is the spot. If you prefer not to be quite so isolated, there are plenty of interesting, fun resorts around the island. In the Kapalua area you might want to check out the Kapalua Villas. They have a new lecture series where you can learn about Hawaii’s marine life. Ke Kani O Ke Kai (Voices of the Sea) is led by a local marine biologist on the first Monday of each month. Did I mention that this is free? If you love food and wine, you will want to plan your vacation for next June to coincide with the Kapalua Wine & Food Festival. You could combine your Food & Wine vacation with some offerings from the Maui Film Festival which is also held in June, over in Wailea. Some of the fabulous resorts on this part of the island are the Grand Wailea which is always a favorite with families because of the wonderful Wailea Canyon Activity Pool, they have also redone their Spa Grande. On the 20th of each month the resort hosts a free fair in the spa’s lobby with discounted spa products, beauty demonstrations and prizes! The Four Seasons Maui has a fantasy tennis camp, a wellness series featuring physical & spiritual practices. The Wailea Beach Marriott has added the Akamai Business Center, a 690 square foot business center that can take care of pretty much any of your copy, print, and shipping needs – as well as offering short time rentals of computers, copiers and printers – which makes it the perfect location for your corporate retreats. And of course, one of my favorite resorts, the Fairmont Kea Lani is in Wailea. This area boasts some fabulous golf courses, restaurants and shopping. Kaanapali is probably the most well known of Maui’s resort areas. Numerous resorts are located on this beautiful beach, and you are close to Lahaina. The Kaanapali Beach Hotel bills itself as “Hawaii’s most Hawaiian Hotel”. They have Hawaiian Cultural activities and entertainment daily; the staff sings when you arrive; they use the Hawaiian language around the resort and in brochures and more (they actually say there are 110 reasons they are the most Hawaiian). If you stay in Kaanapali you will want to be sure to eat at Aloha Mixed Plate – right on the water with wonderful, affordable specials every day. Sandals Royal Bahamian offers not only the sophisticated British elegance of the main resort, but a laid-back off-shore private island giving you 2 vacations in one! The main resort offers 19 room categories including those in the secluded Royal Village – you’ll feel as if you are in your own private retreat. Cottages are nestled beneath fantail palms and fruit trees – expansive bedrooms are divinely plush, intimate pools are places throughout the Royal Village. You may also choose a room in either the Royal Windsor Suite Tower or the Bahamian Manor Tower. There are 10 restaurants at Sandals Royal Bahamian, including the exclusive “Gordon’s On The Pier” exclusively for Butler Level guests. 9 bars, 6 swimming pools and of course the offshore island, will keep you happily relaxed or as busy as you’d like to be. The exclusive Offshore Island has 2 beaches, one for swimming and snorkeling and the other for high energy watersports. There is a lagoon style pool with a swim up bar, Café Goombay for some authentic Bahamian dishes, and the Red Lane Spa zen garden. Sandals Emerald Bay is the first All-Butler Resort in the Sandals line. This was originally built as a Four Seasons resort, has 183 all suite accommodations, 5 gourmet restaurants and 5 bars, 3 pools including a one acre freshwater pool, an 18 hole Greg Norman designed championship golf course, and a 17 acre marina. Sandals Emerald Bay is on Great Exuma in the Bahamas. All oceanfront and all butler (trained by The Guild of Professional English Butlers, as are all Sandals butlers). There are 16 room categories from the Exuma Honeymoon Luxury Suites all the way up to the top of the line Royal Estate 2 Story 1 Bedroom Beachfront Suite with Pool- prime location, sweeping views of the ocean & beach and a private infinity pool. While in the Bahamas, you might want to enjoy some off property excursions like Diving with the Sharks (you can learn to dive at all the Sandals resorts), Swim with the Dolphins, Deep Sea Fishing or Catamaran Cruises. St. Lucia is so lushly alluring that France and Britain fought over her for over 150 years, finally coming under British rule, but still retaining a French influence. From the twin peaks of Les Pitons, the sulfur springs reknowned for their restorative powers, the abundance of the lush rainforest, the fiery passions of its ancient volcano, to the charm of Marigot Bay where “Dr. Dolittle” was filmed – St. Lucia is a dazzling Caribbean paradise that casts her spell of romance and adventure at every turn. Sandals Regency La Toc, “The Emerald of the Caribbean” is set on 250 acres of lush, tropical, hilly terrain plus a dramatic ocean bluff, which overlooks the amazing half-mile cove beach of white sand and turquoise waters. You can choose from one of 19 room categories in the Piton Villa Suites, the Emerald Village, or the Sunset Bluff Suites featuring the incredible Millionaire Suites. Sandals Regency La Toc has the most plunge pools of all the Sandals resorts. There is a 9 hole golf course on site with complimentary greens fees. 9 restaurants, 10 bars, 3 swimming pools, and of course, a Red Lane Spa. Sandals Grande St. Lucian is set on its own peninsula surrounded by spectacular Caribbean views, from both sides of the resort. From the moment you enter the 3 story open-air lobby, you are overcome by the stunning views of Rodney Bay. Elegant sitting areas invite you to relax and enjoy the cool ocean breezes. Among the 16 room categories at this resort, you can choose an exotic swim-up room where you can stp from your living area into the clear waters of a lagoon pool. Or maybe a Rondoval Suite would me more to your liking, offering a unique indoor/outdoor experience. With 8 restaurants, 6 bars, 5 swimming pools, and complimentary golf at Sandals Regency La Toc, everything you need is right here. Continental breakfast room service is available to all guests at Sandals Grande St. Lucian. Sandals Halcyon Beach is the 3rd Sandals resort on St. Lucia. This intimate, quaint and romantic resort has just 169 rooms, and is a low rise resort offering a laid back, tranquil and casually elegant experience set in tropical gardens. With full exchange privileges at the other 2 Sandals resorts, you get all of the amenities of the larger resorts, with the intimacy of a small resort. Sandals Halcyon offers St. Lucia’s most impressive dining option – The Pier Restaurant set out over the water. There are 3 other restaurants, 7 bars, 2 swimming pools. Remember, with full exchange privileges at all 3 resorts, you have 18 dining options, complimentary golf and complimentary shuttle service between the 3 resorts. Welcome to Antigua – an island with a beach for every day of the year! And Sandals Grande Antigua sits on one of the best. Set among lush gardens, this incredible resort offers everything you could possibly want in a Romantic vacation. The gentle trade winds will keep you cool, even during the midday sun. The glimmering turquoise sea will beckon to you. Relax in a lover’s chaise or hammock. Sip cocktails in the sunset tower, reserve a private cabana in the Eastern Caribbean’s largest pool, browse quaint shops, or renew your senses at the Red Lane Spa. When choosing your room from the 17 available categories, you will need to decide if the Caribbean Village, Mediterranean Village, Rondovals of Eden or the Mediterranean Plunge Pool Villas suit you best. At meal time, which of the 9 restaurants sound good today, or maybe room service would be best. Which of the 8 bars does the best job on your favorite cocktail? Should you enjoy a private plunge pool, or will one of the 6 main pools in the resort do? If you enjoy getting off the resort, (although why would you need to?) 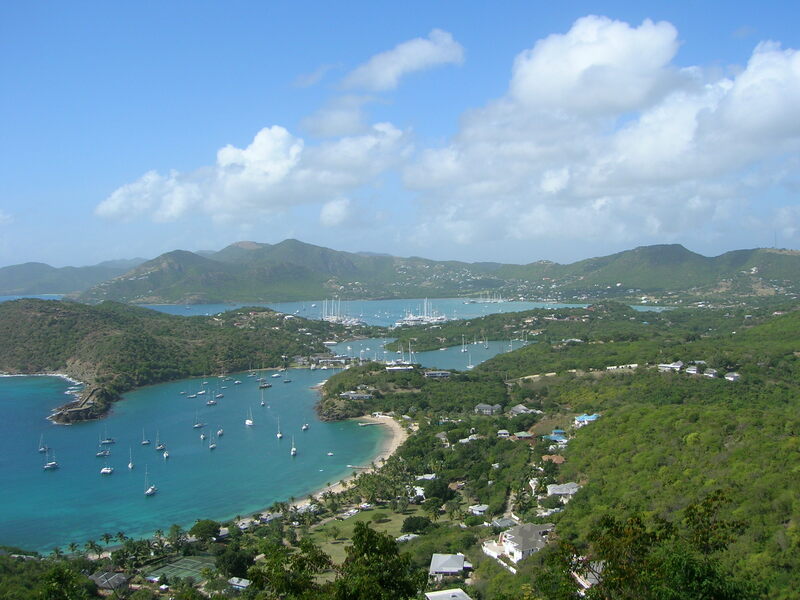 there is plenty to do on Antigua. You can go next door to the Casino. 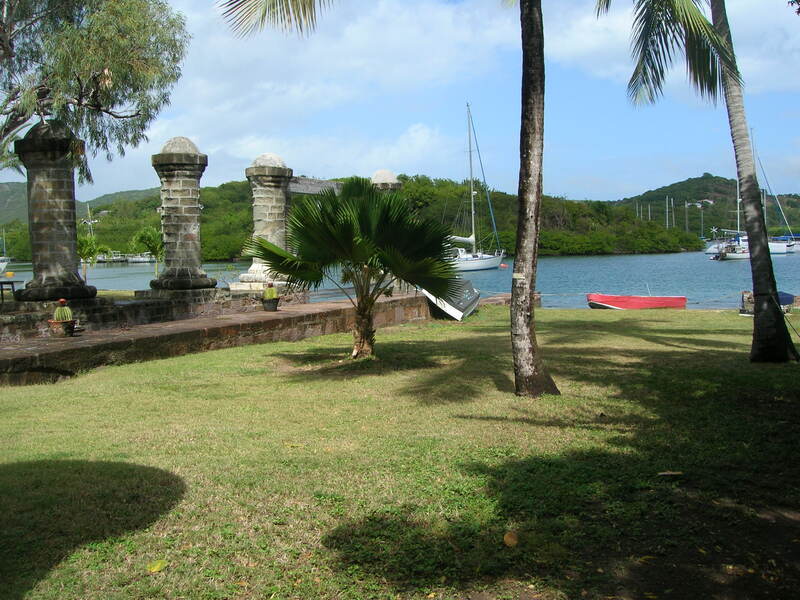 Definitely visit English Harbour, established by British admiral Lord Nelson in 1784 as a naval base and still a working shipyard. 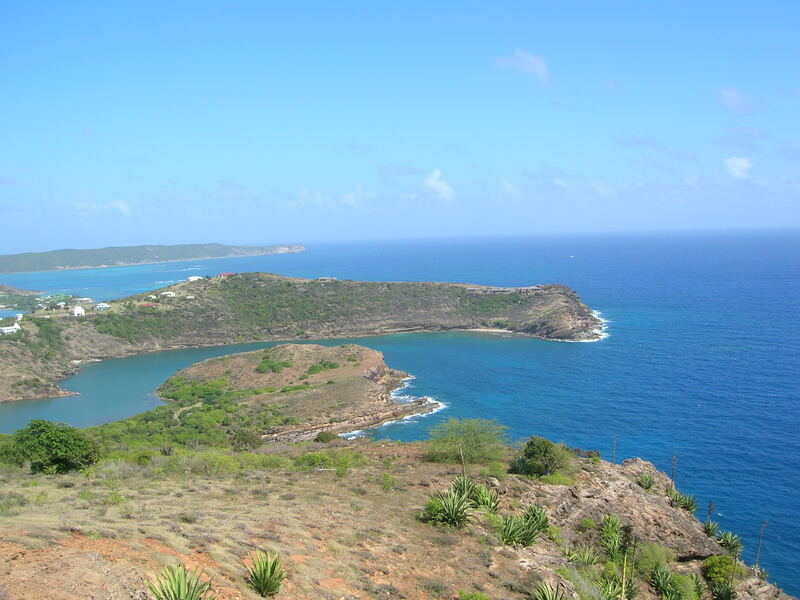 Visit Shirley Heights and get a great view of neighboring islands or see a fabulous sunset. Take a catamaran for a Bird Island cruise for bird watching or to neighboring Barbuda or go zip-lining over the rainforest. Of course, Sandals Grande Antigua offers all of the Luxury Included amenities that you find at the other Sandals properties.